When using the KERDI-BOARD-SN prefabricated shelf, determine the desired height of the shelf and mark with a level line. Set tile up to that line on the back and sides of the niche. 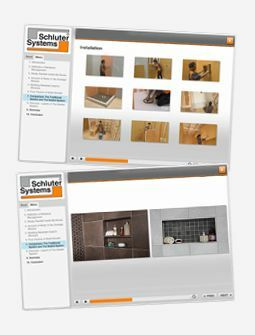 Butter the sides and back of the shelf with Schluter SET™, ALL-SET™, FAST-SET™ or unmodified thin-set mortar and solidly embed it in the niche, resting on the previously installed tile. The shelf may be raised at the back to create a slope, or the tile may be set on a slope during the installation to prevent water from pooling in the finished application.